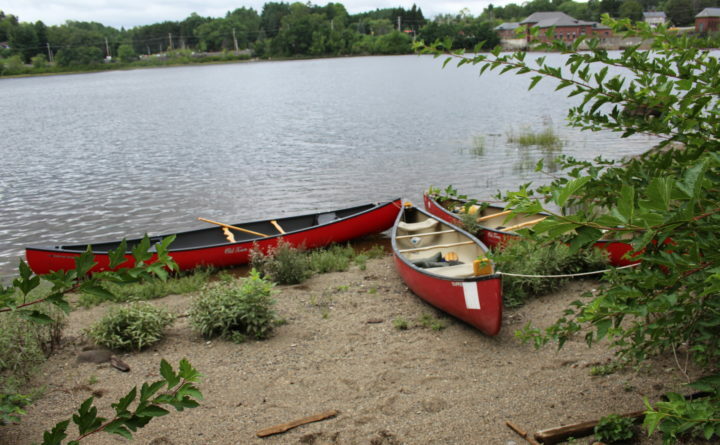 Three canoes sit on the beach on the grounds of the Penobscot Salmon Club in Brewer, where members of the Penobscot River Paddling Trail set up a campsite on Saturday. BREWER, Maine — River-watchers who glanced out at the Penobscot River on Saturday may have seen an odd-looking craft float past: a 12-foot table lashed to a pair of canoes. 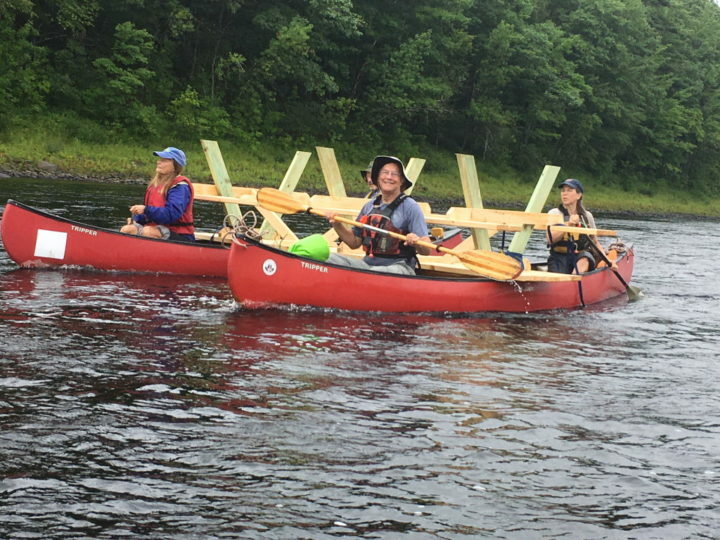 Volunteers for the Penobscot River Paddling Trail paddled the makeshift catamaran from a landing in Orono to a riverfront campsite-under-construction on land owned by the Penobscot Valley Country Club. It’s part of the group’s effort to create a network of campsites that will stretch 100 miles from Medway to Bucksport. “From our standpoint, the ideal site is hard to access from the road, and easy to access from the water, so that people aren’t always camping there [when a paddling group arrives],” said PRPT president David Thanhauser of Swanville. In 2013, Thanhauser and Cloe Chunn paddled the Penobscot from Mattawamkeag to Bucksport, and realized that there was a basic piece of infrastructure missing: Campsites were hard to find, or unavailable. And any sites that did exist weren’t listed as part of an organized list of Penobscot River corridor assets. Cloe Chunn (left), David Thanhauser (obscured), Tom Rutka and Patti Rutka shuttle a 12-foot-long picnic table from the Orono town landing to a campsite on land belonging to the Penobscot Valley Country Club on Saturday. The foursome are members of the Penobscot River Paddling Trail, and are trying to set up sites for paddlers to camp out from Medway down to Bucksport on the river. In April of 2016, Thanhauser shared his idea for a Penobscot River Trail at a conference, and found others were enthusiastic about the possibilities. The group actually incorporated under that name, but decided to sell that label to the Butler Conservation Fund, which was in the process of organizing a wilderness education and recreation center near what is now Katahdin Woods and Waters National Monument. Members then re-incorporated as a non-profit, adding the word “Paddling” to their title. The Penobscot River Paddling Trail was born. To that end, on Saturday volunteers delivered the picnic table to one site while doing work on a second location, at the Penobscot Salmon Club in Brewer. The group that day was replacing the posts on a rotted out educational kiosk in Brewer, and would be putting up another educational display in the future, said Clayton Cole of Corinth, the organization’s vice president. At sites up and down the river, different displays could be used to focus on things that matter to individual landowners who decide to host a campsite, he said. At the Brewer site, the rich Atlantic salmon fishing heritage would likely be explained in any exhibit. At other spots, historical, cultural and geological information would be shared. All along its course, the river’s special qualities would be preserved. “It’s a beautiful river with a noble history,” said member Patti Rutka of Saco. 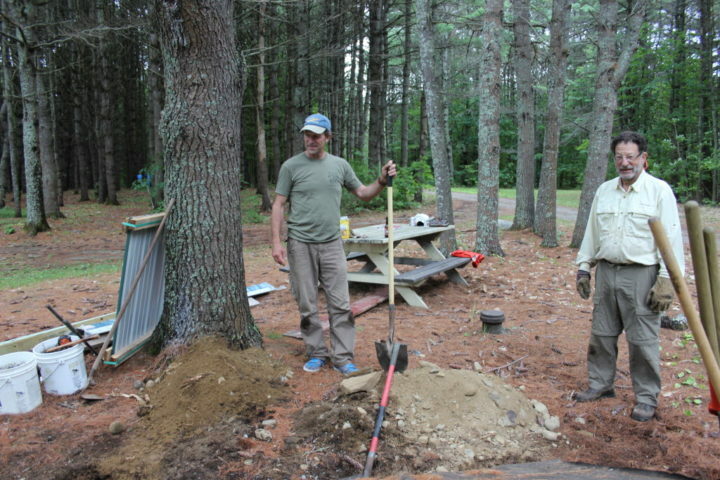 Clayton Cole (left) and David Thanhauser of the Penobscot River Paddling Trail pause while digging holes for mounting an educational kiosk at the Penobscot Salmon Club in Brewer. In addition to campsites at the Penobscot Valley Country Club — where getting rid of some poison ivy will be a priority — and the Penobscot Salmon Club, the trail includes sites in Howland at Merrill Brook Cabins and at Penobscot River Cabins. Chunn said many interested landowners have indicated that they’d be happy to host a campsite, but the PRPT hasn’t been able to establish those sites yet. And in the future, she said she hopes people sign up to help paddlers portage around the three dams that stand between Medway and Bucksport. She said aiming for 10 campsites over the 100 miles would be adequate if relatively few people were on the river, because a 10-mile paddle in a day is manageable. But she said she hopes the group is able to establish more sites than that, and can find members to act as stewards of those locations. Anyone interested in getting involved with the Penobscot River Paddling Trail can reach David Thanhauser at dthanhauser@gmail.com. The group is looking for stewards, volunteers and landowners who can help, and is also seeking a tech-savvy individual to handle a website and create an online presence.